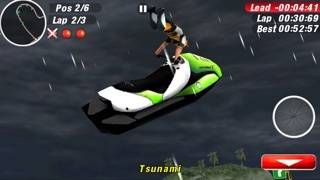 This game is sick, graphics are equal to PSP quality and the gameplay is fantastic, the accelerometer steering is realistic, and the wave physics add to the realism of the game . 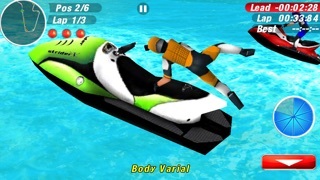 The first Aqua Moto Racing has been my most played game, but now I am sure Aqua Moto Racing 2 will become the top played game for me. - Proper iPhone 5 support. AppSmile: "this game’s beautiful graphics, amazing controls, and competitive nature will leave you soaked and wanting more." 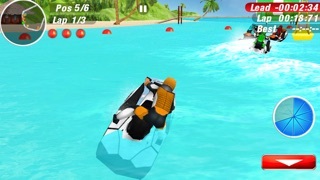 PocketGamer: "Pumped and packed with action" - "Water here is a wild, untamed beast, feeling realistically fluid"
iLounge: "Aqua Moto Racing 2 comes closer to Wave Race 64 than most of the clones that have appeared over the years"
AppSpy: "look no further than this excellent example of fun, adrenaline pumping aquatic mayhem." CNET: "will appeal to anyone who likes unique racing games." AppAdvice: "All in all, it’s a brilliant game." 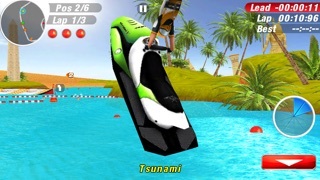 Appmodo: "The graphics and water motion are amazing"
Touch Arcade: "An Already Great Game Gets an Even Better Sequel"